On April 30, 2014, I attended a lecture at Soka University in California entitled “What Graphic Novels Tell Us About Cancer Care, Greedy Stories, and the Ethnographic Method” by Juliet McMullin, a professor of anthropology at the University of California-Riverside. Among other topics, Professor McMullin researches health knowledge and medical inequalities. She spoke about engaging her students with the topic of health inequality through the study of graphic novels as hybrid illness narratives, with a particular focus on cancer autobiographies. 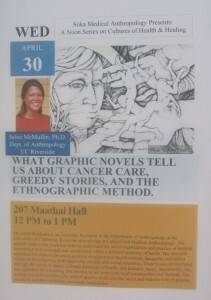 She asked us to consider ways in which graphic novels can both obfuscate and bear witness to the everyday suffering of cancer patients and their families, move us to action, and connect or disconnect audiences with narratives of chronic disease. While many narratives around cancer focus on the binary of “survivorship” or “death,” living with cancer is a chronic condition. Discourses of hope, such as foundations that urge us to “participate,” “donate,” “walk / run,” or “fundraise” for some ubiquitous “cure,” can work to obscure the lived experience of healthcare inequality. She urged us to reconsider the “discourse of hope” around cancer narratives. McMullin pointed out that she is not against hopefulness during illness, but rather that the discourse of hope can be a very greedy story. It places demands on the patient and their family to maintain a positive, hopeful, can-do attitude in the face of something that is disheartening and debilitating. For example, while various “walks for the cure” may seem to give patients and their family members agency over the search for a cure for cancer, the mentality that a cancer patient must “stay positive” can place undue pressure on someone undergoing invasive, painful, and generally not positive or pleasant medical procedures. McMullin argues that graphic novels about cancer can help to illuminate the “ordinary, chronic, cruddy” lived experience of cancer without the catastrophic, crisis-laden, or sublime rhetoric of “survivorship” or “death.” She challenged the audience to look beyond statistics about cancer death rates, and consider what is overlooked in medical meta-narratives. For example, one of her informants, “Ruth,” told McMullin that a doctor explained different rates of breast cancer and cervical cancer in women by telling Ruth that Anglos get breast cancer more often because they are smokers, while Latinas get cervical cancer more often because they become sexually active earlier in life and have a greater number of sexual partners. Ruth, a Latina, found this story insulting because it was not aligned with her personal narrative, and found it unnerving that the doctor had made up this story based on his own interpretation of statistics. McMullin reminded us that access to medical care is a piece of the complicated patterns of inequality in society. As another example, she offered a recently released chart from the American Cancer Society that shows the statistics of avoidable deaths that disproportionately impact disadvantaged populations. 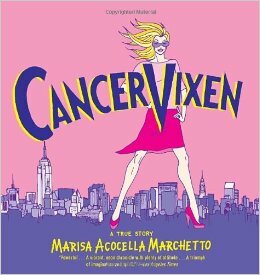 These visualizations of charts and statistics are part of the narrative of cancer that is articulated in medical graphic novels. 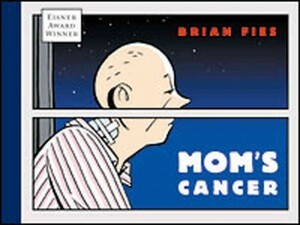 Other examples of this visualization that McMullin pointed out are Brian Fies’ framing of his mother’s life in Mom’s Cancer, where the repetition of the cover image on the front and, altered, on the back of the book offers a gutter as a central element that serves to fracture time and space, but also makes the human act of closure complicit in his narrative (with props to Scott McCloud). 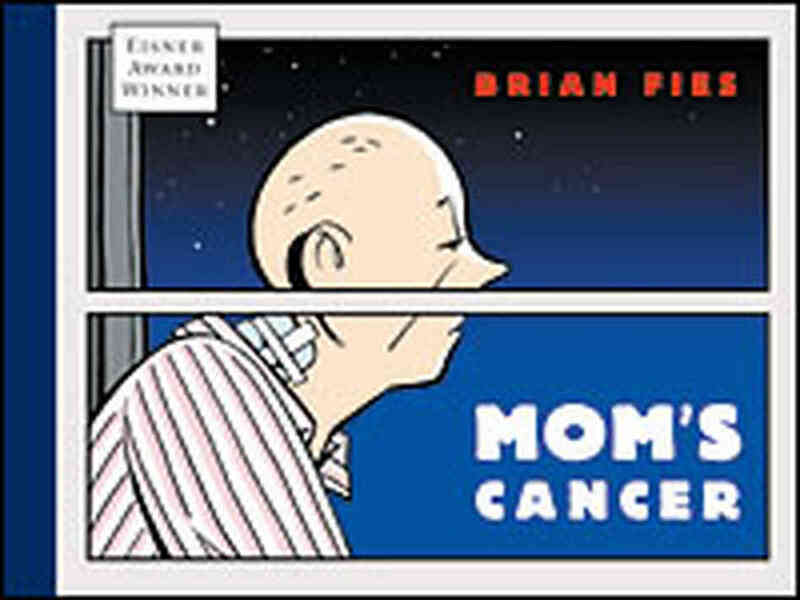 A 2005 Eisner Award winner, Mom’s Cancer is a widely successful and popular contribution to the visualization of bio-medical narratives, giving a face to the suffering of cancer patients and their families. 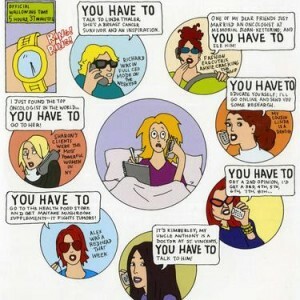 Another example of this practice of visualization is a page from Marisa Acocella Marchetto’s Cancer Vixen: A True Story, where the protagonist is surrounded by bubbles representing the advice the is overwhelmingly thrown at her, all including the phrase “you have to…” (call this doctor, research this new cure, take care of yourself, and so forth). This overwhelming page distills the anxieties of daily life for overwhelmed patients undergoing chemotherapy and attempting to continue some semblance of their daily routine, according to McMullin. To help her students work with the human narratives of lingering trauma, she had them interview people in their lives who had experienced cancer and draw the relationship between people and the biomedicalized objects that contribute to their story. She encouraged students to tell a story about their ethnographic projects with words and pictures. This exercise was intended to help them to make sense of objects in tandem with interviews and hone their anthropological thinking. One student submitted imagery that demonstrated a doctor’s power to dominate patient-doctor interactions, showing a large doctor looking down on a diminutive patient who remains faceless throughout the interaction. This imagery was drawn after a conversation the student had with an informant who reported that her concerns regarding a growing lump in her neck were dismissed by three different doctors before she was finally diagnosed with cancer. The visual depiction represented the young female informant’s feeling of being looking down upon and disempowered in her interactions with older male physicians. This aligns McMullin’s findings from her earlier ethnographic work with informants regarding the treatment of cervical cancer in the Latina population. 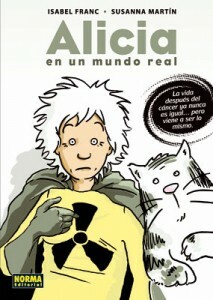 Through creating comics about the informants’ experiences, students could visualize inequality in medical interactions. Similar work is being done from medical practitioners, as Dr. Michael Green’s 2013 comic contribution to the Annals of Internal Medicine demonstrates. Green visually relates a narrative of a missed diagnosis, which now forms a part of the medical discourse in a peer-reviewed journal. McMullin argues that graphic novels have the power to challenge inequality and that the gutters give us a moment to imagine another way of being in the world. 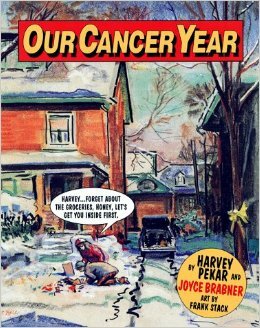 It will be fascinating to watch the dissemination of doctor and patient education, as well as multiple interpretations and representations of cancer narratives, continue to grow with the increased availability of resources in graphic medicine. For example, since 2009, Penn State College of Medicine has offered a course in “Graphic Storytelling and Medical Narratives” that helps medical students exercise their communication skills in another medium. Likewise, the graphic novel Dreams of a Low-Carbon Future is an example of scientists striving to improve communication with the lay population regarding climate change. “Two Years” by Randall Munroe on xkcd. “Graphic Medicine” is a website devoted to “the interaction between the medium of comics and the discourse of healthcare.” They host a series of conferences, as well. The Witness Project, founded by Deborah Erwin, is “a theory‐based intervention designed to provide culturally sensitive messages” regarding breast cancer. “Breaking Quarantine: Image, Text, and Disease in Black Hole, Epileptic, and Our Cancer Year” in Image Text: Interdisciplinary Comics Studies by Bruce Dadey.